From the onset, director Damien Chazelle balances astronaut Neil Armstrong’s (1930-2012) life between the professional and the personal; initially plummeting through the atmosphere ensconced in space attire, versus his raw heartbreak, while caring for his dying daughter, Karen (1959-1962); Ryan Gosling humanizes (with the aid of Neil’s sons Eric and Mark) this remarkable, taciturn icon, whose legendary walk on the moon, July 20th, 1969, “was the greatest feat in the history of the world since creation”; Gosling depicts Armstrong, crippled emotionally, with verve and brilliance, rising above his sorrow, in favor of “mankind”. At his side, protector, nurturer, his wife Janet (Claire Foy’s performance is subtle, strong, silent and intense); 2013’s “The Astronaut Wives Club”, by Lily Koppel, lends legitimacy and insight into the travails these women confronted, always with the specter of doom, hiding behind artificial smiles, in the recesses of their minds. “First Man” is a birds eye retrospective of the enormity of NASA’s attempts to fulfill President Kennedy’s 1962 speech in Rice Stadium, Houston, Texas, September 12th; “we choose to go to the moon” a rallying cry to the American people, in support of the Apollo program. Chazelle’s romanticism, his senior soul, masked by his youth, resonates in a dazzling musical score; Justin Hurwitz (“La La Land”) captures the “loneliness and beauty” of the journey from earth to a landscape 238,900 miles away; wrenchingly, plaintively alluring, the music matches the monumentality of the mission and its success; elegance sensationally paired with technology, leaving one profoundly affected by its exploits. 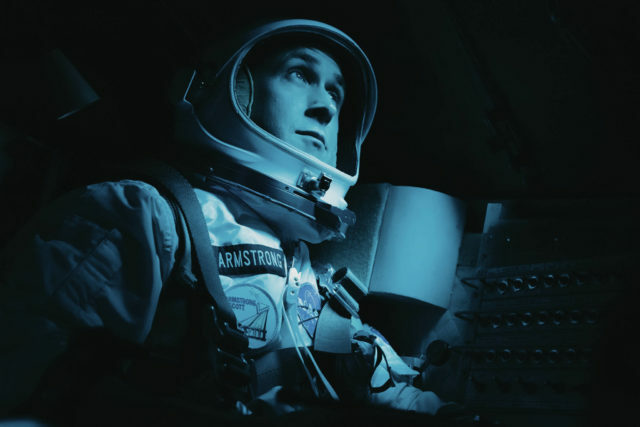 “First Man” soars as a portrait of a man who orbited the sublime, while his soul remained tethered to the planet of his genesis.